In the third installment, the epic war between man and machine reaches a thundering crescendo: the Zion military, aided by courageous civilian volunteers like Zee and the Kid, desperately battles to hold back the Sentinel invasion as the Machine army bores into their stronghold. Facing total annihilation, the citizens of the last bastion of humanity fight not only for their own lives, but for the future of mankind itself. But an unknown element poisons the ranks from within: the rogue program Smith has cunningly hijacked Bane, a member of the hovercraft fleet. Growing more powerful with each passing second, Smith is beyond even the control of the Machines and now threatens to destroy their empire along with the real world and the Matrix. 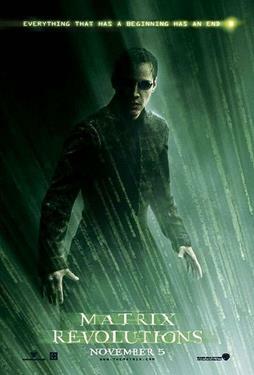 The Oracle offers Neo her final words of guidance, which he accepts with the knowledge that she is a program and her words could be just another layer of falsehood in the grand scheme of the Matrix. With the aid of Niobe, Neo and Trinity choose to travel farther than any human has ever dared to go - a treacherous journey above ground, across the scorched surface of the earth and into the heart of the menacing Machine City. In this vast mechanized metropolis, Neo comes face to face with the ultimate power in the Machine world--the Deus Ex Machina--and strikes a bargain that is the only hope for a dying world. The war will end tonight, with Neo's destiny and the fate of two civilizations inexorably tied to the outcome of his cataclysmic confrontation with Smith.